As we prepare to have new windows installed in our building this spring, we are taking a look at our exhibits to determine what will be done with them as the workmen remove old windows and install new. The weather being what it’s been this year, we’re conscious of rain, wind, (but hopefully not snow!) as well as security for our artifacts. 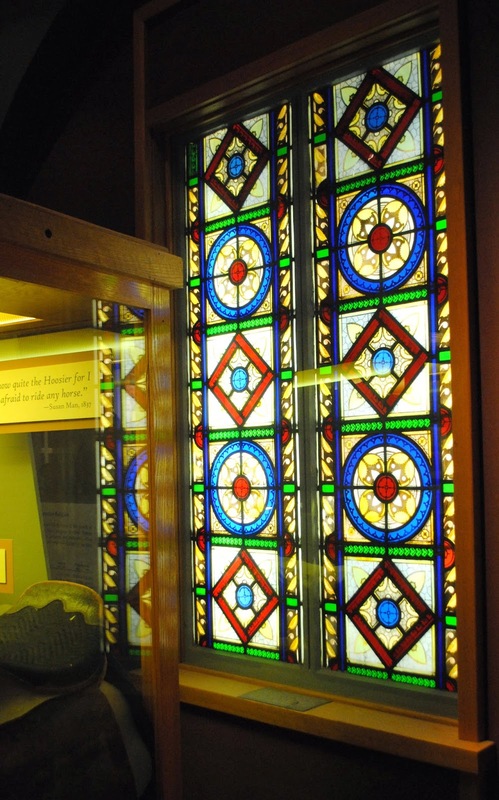 In the process of cleaning and doing some maintenance on exhibits earlier this month, we found that with a little re-arranging in our downstairs galleries, we were able to once again put on display a stained glass window from the chapel that was once in the original convent at St. Joe Hospital. St. Joe was founded by the Poor Handmaids of Jesus in 1869 in the former Rockhill House hotel located on the southwest corner of Broadway and Main Streets. The window uncovered--you are looking toward Barr Street. Randy Elliott, exhibitor, and Karen Butler-Clary, registrar, examine and clean the window. Close up of one of the panels. 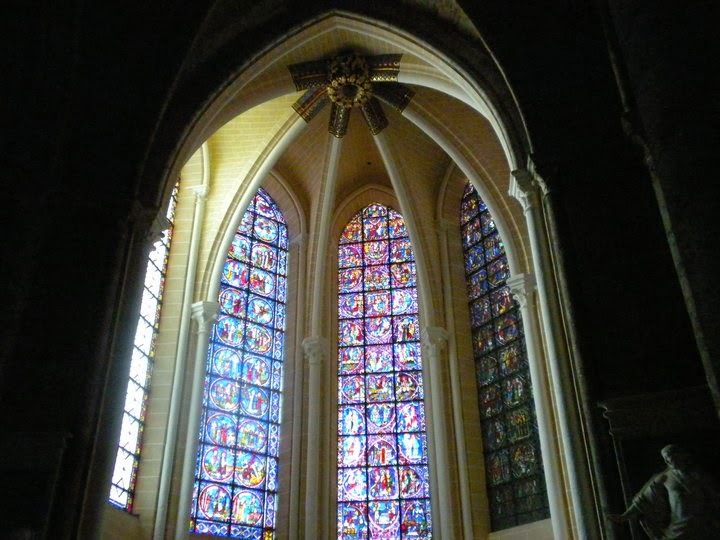 One of the best examples of the use of stained glass can be found in Chartres Cathedral in Chartes, France. Here is a photo I took several years ago of just one of many stained glass windows there. If you go to France, you must go to Chartres, if for no other reason than to see this Cathedral. The website http://www4.uwm.edu/letsci/arthistory/StainedGlass/history.cfm provides more information on stained glass if you’d like to do further study. The information below was written by Shannon Fitzgerald. In the Romanesque Period of the 12th Century, “the relatively small windows of the period were designed to admit as much light as possible. Thus, images made with predominantly red and blue glass were then surrounded by white glass. In the Gothic Period of the 13th - 14th Century, more geometrical shapes were incorporated into windows and decorative borders employed. 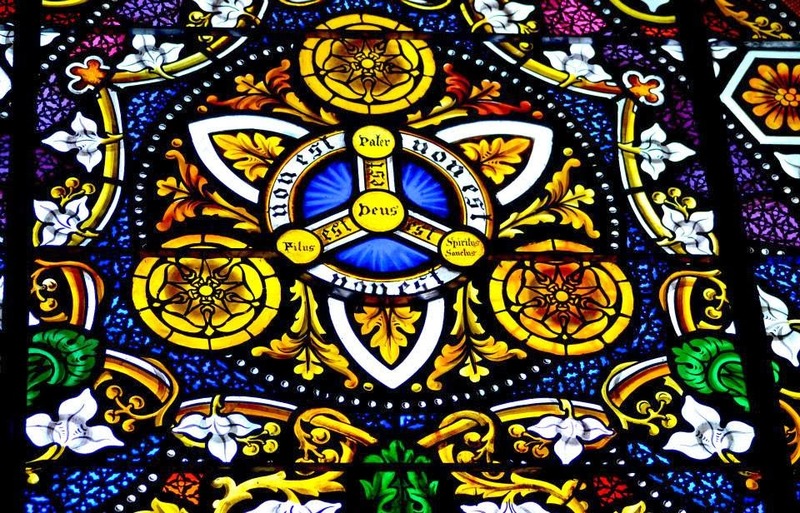 “The emergence of the Rose Window at St. Denis Cathedral and Chartres Cathedral, both in France, greatly influences the field throughout Europe as providing a means to depict more complex ideas as embellishments in Biblical narrative become prevalent. During the Reformation in the sixteen century, glass makers sought more secular commissions as the making of religious imagery came with severe penalties. 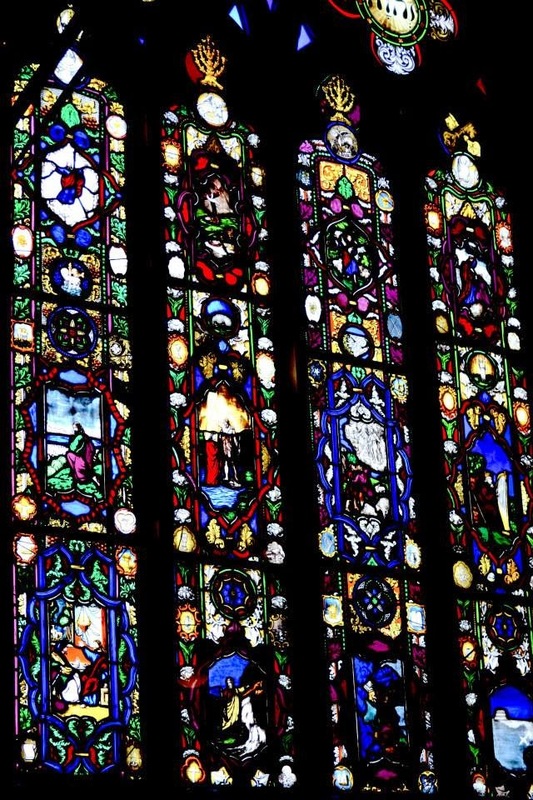 Many stained glass windows were destroyed in churches including those in France and England. 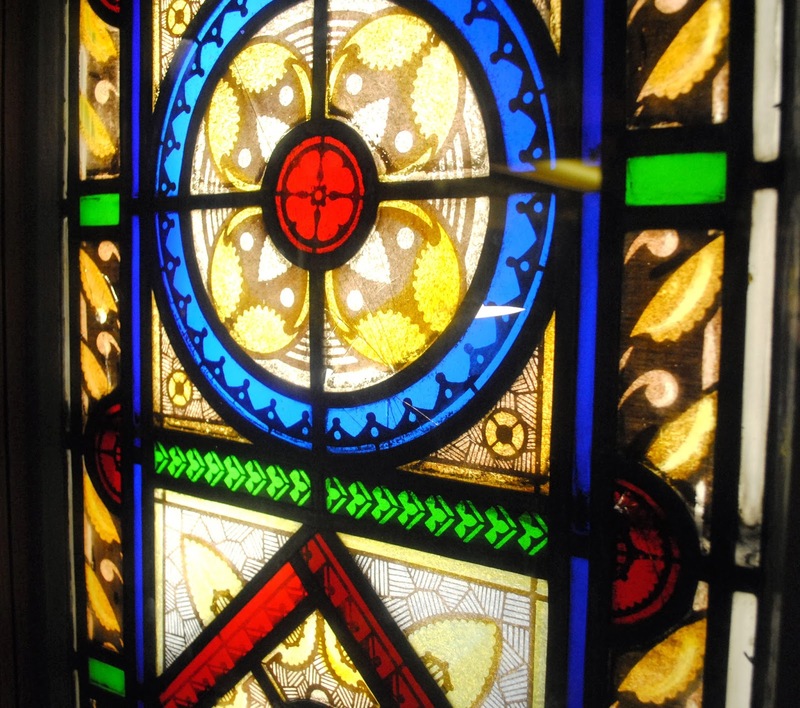 Many of Fort Wayne’s older churches have stained glass windows. Here are a few photos from Trinity Episcopal Church, at the corner of Fulton and Berry, which was completed around the time of the end of the Civil War. 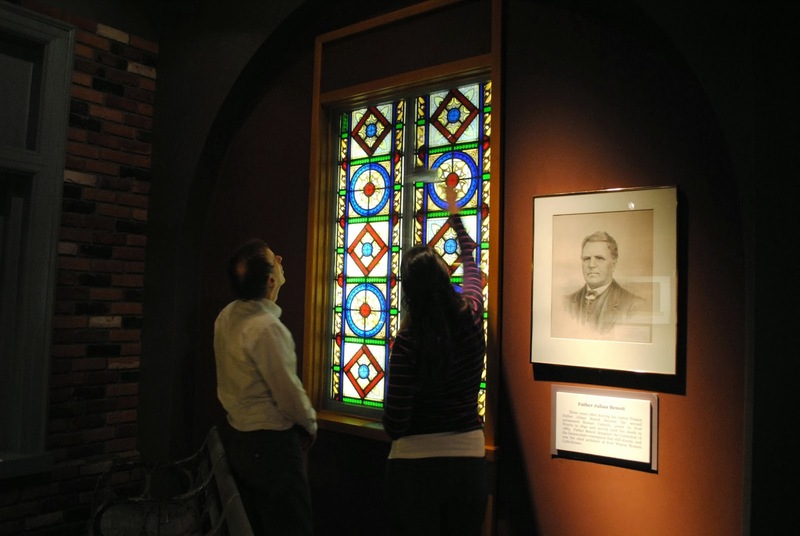 If you have photos of local stained glass windows in our community that you would like to share with the History Center’s Facebook followers, please send them to nancy.mccammon-hansen@fwhistorycenter.com.